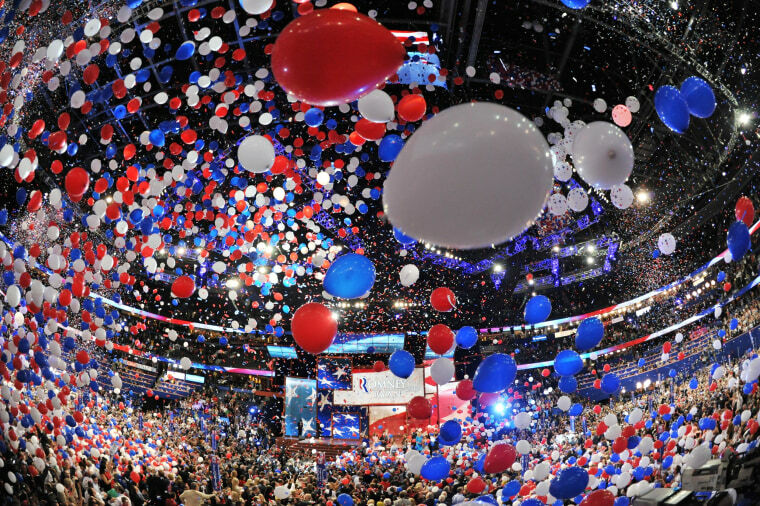 NBC's Ali Vitali reports: "Republican National Committee officials met with the Trump campaign in New York City Wednesday to brief them on what RNC operations might look like should Trump win the nomination, a D.C. insider told NBC News. According to the source, several high-ranking members of the RNC were in attendance, with Trump campaign manager Corey Lewandowski among those at the table representing the Trump campaign. Donald Trump was not present, but was informed about the meeting." A new WBUR poll shows Trump still on top in New Hampshire, with Chris Christie surging into second place. The New York Times notes how much the fear of terrorism has lifted Trump's poll numbers. The big picture, from the New York Times: "A day-by-day analysis of how the top-tier Republicans seeking the White House spent the crucial month of November reveals that, in this campaign, a strenuous itinerary does not necessarily translate to robust poll numbers." From the Washington Post, on brokered convention chatter: "Weighing in on that scenario as Priebus and Senate Majority Leader Mitch McConnell (R-Ky.) listened, several longtime Republican power brokers argued that if the controversial billionaire storms through the primaries, the party’s establishment must lay the groundwork for a floor fight in which the GOP’s mainstream wing could coalesce around an alternative, the people said. The development represents a major shift for veteran Republican strategists, who until this month had spoken of a brokered convention only in the most hypothetical terms — and had tried to encourage a drama-free nomination by limiting debates and setting an earlier convention date." TRUMP: From one of us(! ): "Nearly six-in-10 Americans oppose Republican presidential candidate Donald Trump's proposal to bar Muslims from entering the United States, but Republicans are evenly divided, according to a new national NBC News/Wall Street Journal poll. Fifty-seven percent of all adults disagree with Trump's proposal, versus 25 percent who agree. But views are mixed among Republicans: 42 percent of GOP respondents support Trump's proposal to ban Muslims from entering the U.S., while 36 percent oppose it." The AP's latest take on the polling: "Republican voters don't think Donald Trump is likable. They don't think he's compassionate. And many don't consider him particularly honest. But he's overwhelmingly viewed as decisive and competent. And that's what matters most — at least for now — to Republicans." Aaaand he's going after Ted Cruz after that New York Times story about him questioning Trump's judgment, tweeting: . @tedcruz should not make statements behind closed doors to his bosses, he should bring them out into the open - more fun that way! Yesterday, in New Hampshire, he said: "Anybody killing a police officer - death penalty is going to happen." CLINTON: The New York Times notes that Clinton is no longer laughing about the possibility of a Trump nomination. RUBIO: The Des Moines Register: "Marco Rubio called for improving the Veterans Administration through accountability, transparency and expanded health care choices Thursday, saying benefits should “follow” the veteran similar to how tuition benefits in the GI Bill follow students." Rubio -- along with Sens. Tom Cotton and Joni Ernst -- writes this piece: "Obama’s Pressing ‘Delete’ On Key Counter-Terrorism Intelligence. Here’s How We’re Stopping It." The latest on the Paris climate talks, from the AP: " High-stakes climate talks outside Paris will not end Friday as planned but will continue at least one more day as diplomats try to overcome disagreements over how — or even whether — to share the costs of fighting climate change and shift to clean energy on a global scale. Negotiators from more than 190 countries are trying to do something that's never been done: reach a deal for all countries to reduce man-made carbon emissions and cooperate to adapt to rising seas and increasingly extreme weather caused by human activity. U.S. Secretary of State John Kerry zipped in and out of negotiation rooms as delegates broke into smaller groups overnight to iron out their differences." *** Friday’s “Andrea Mitchell Reports” line-up: Joining Andrea Mitchell at 12noon ET – Chuck Todd on the latest NBC News/WSJ poll; 9-11 first responder John Feal; Gayle Lemmon – author, journalist and Senior Fellow at the Council on Foreign Relations; and the Washington Post’s Ruth Marcus and Chris Cillizza.